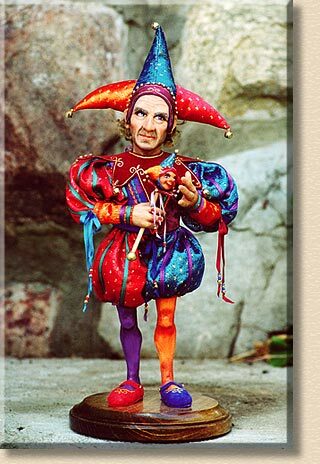 Not too happy all dressed in his bright parti-coloured outfit, the midget jester brandishes his jester stick as a threat to anyone who might just laugh at him. Media: Head, hands and legs of Super Sculpey, on a wire armature, with cloth body. He has a bit of brown mohair under his tri-pointed silk jester's hat. His legs are painted purple and orange. He has a blue and a red leather shoe. His puffed pants and upper sleeves are red and blue silk with gold dots. Lower sleeves are orange silk with gold dots and purple and turquoise silk ribbon trim. His bodice is blue and red brocade with embroidered trim. He has a red leather collar with gold painted trim and gold bells. Props: He holds a jester stick of Sculpey III and Super Sculpey, with red leather collar and silk ribbons.